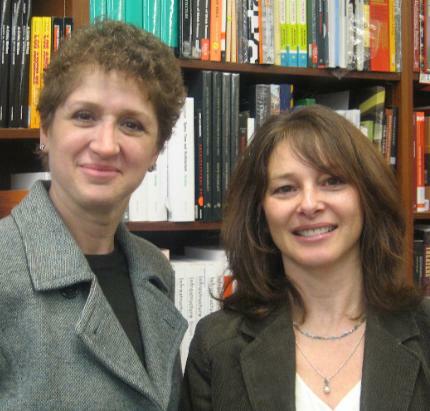 Last week, journalist Claudia Gryvatz Copquin (right) visited Book Culture to talk about The Neighborhoods of Queens. She was introduced by her colleague and childhood friend, Sonia Estreich (left), Managing Editor of the project that produced this book. The Neighborhoods of Queens is the second in a series that will be published on each of the five boroughs of New York. The first book, The Neighborhoods of Brooklyn, was published in 2004. Recent press about this just released book include mentions in The Daily News and The New York Times. Tess of the D’Urbervilles, which was my pick for the monthly book club I’m in. Do you have standard titles or writers that you like to recommend? John Irving, Pete Hamill, Anna Quindlan, David Sedaris and Woody Allen. Entry filed under: Events, Q & A.